What is fatigue failure? Fatigue failure is the rupture of a material as a result of repeated loadings at a stress much lower than the yield strength of the material under static conditions. If the stress is high enough, but only a fraction of the yield strength in a static condition, all materials will fail under repeated cycling. However, some materials are much more fatigue resistant than others. Even at very low stress aluminum, copper and brass will fail long before steel and titanium. Because the density of aluminum is very low airplanes have for a long time been constructed of aluminum. With aluminum’s relatively poor fatigue resistance, aeronautical engineers have to determine the lifespan of the aircraft based on how many times the plane will take off and land and how many hours it will fly. High stress components on aircraft, like wings, are routinely replaced to prevent fatigue failure. Fatigue studies show that a very smooth surface can dramatically increase the number of cycles before fatigue failure. Fatigue fractures start from areas of localized concentration of stress, usually areas with a nick or a scratch mark or a manufacturing defect. That’s because metals are notch sensitive. Almost all aluminum roller ski shafts that fail are due to bruise or scratch marks on the bottom of the shaft or on the wheel forks where these indentations create high stress areas that cause fatigue crack propagation. When wheel forks are welded to roller ski shafts the strength of the aluminum of both parts in the welded area is reduced. Failure at the welded joints after repeated cyclic loading is referred to as fatigue weld propagation. A weld that does not create fusion between the two parts is visually apparent and if a load is applied to the weld joint it will fail immediately. The pneumatic wheel roller skis that we produced between 1999 and 2003 used rivets to fasten the wheel forks to the shafts. However, after cyclical stress the rivet joints would loosen. We have been using welded joints on the pneumatic wheel skis for 15 years and they have been very reliable with only a few crack propagation failures due to fatigue. Composite fibers, like aramid (Kevlar) and carbon, bound with epoxy, have exceptional fatigue life. Hybrid fiber/metal/epoxy composites have even better impact and fatigue strength than pure fiber epoxy composites. This is why today most military and commercial planes have changed to composite or fiber metal composite technology for components under high stress. Snow skis are under very little stress because they bottom out against the snow. 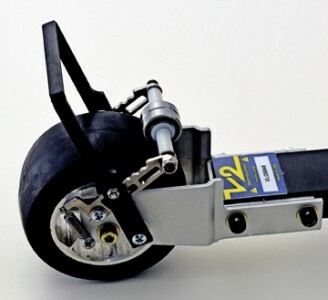 Roller Skis are under extreme stress as the shaft is supported by wheels only at each end and can’t be flexible because the shaft can’t be permitted to bottom out against the pavement. In order to reduce road vibration there must be some deflection of the shaft, but for aluminum the deflection must be very limited or the shafts will fail prematurely. With more fatigue resistant composite construction like the one used in the V2- XLK, the shafts can be designed to flex more and therefore feel more like skiing on snow. Wood: Wood has quite good fatigue resistance and absorbs vibration quite well. But even the strongest wood materials have a modulus of only 20% that of aluminum so the shafts have to be thicker to withstand the load. This can make them much heavier unless they are reinforced with composite fibers. Wood based roller ski shafts usually have a lot more deflection than aluminum shafts. Because of the low modulus the energy return of wooden core shafts is low and the skis are less responsive than skis made with composite shafts. Hybrid Fiber Metal Composites: Hybrid fiber metal composites have very good fatigue and impact resistance and are also very light. With both unidirectional and biaxial fibers bonded to a core designed to absorb impact they dampen vibration better and feel more responsive than any other construction. That’s why the V2-XLK feels more like skiing on snow than any other construction method.